Modular construction presents a number of unique benefits over traditional, stick-built construction, and 2017 showed a number of examples of this fact. From time savings to structure durability, project leaders are finding modular construction as a solution more and more. In 2017, the United States economy and society had some interesting and occasionally terrifying obstacles to overcome. The United States GDP increased every quarter and consumer confidence reached a 15 year high. Companies ranging from multinational corporations to small businesses grew optimism for the future and saw growth potential unlike anything in years. However, the year was not without its issues. With hurricanes of historic levels like Irma and Harvey, many companies, schools, and hospitals sustained tremendous damage to their facilities, rendering them completely inoperable. These two factors might not seem to have a relation at first, but in both instances, modular construction helped a variety of sectors solve their unique problems in 2017. First, one of the biggest developments in the modular construction industry in 2017 was Marriott International’s adoption of their modular construction initiative. Marriott, who currently holds over 6,000 properties across the globe, stated the hospitality giant was looking to sign 50 hotel deals in 2017 that utilized prefabricated modules in their design. Marriott decided to turn to modular construction in an effort to minimize project timelines and get their new hotels up and running as quickly as possible. Marriott’s Chief Development Office, Eric Jacobs stated, ”Construction is the next frontier for innovation, and modular is leading the way.” Through modular construction, Marriott looks to slash project times to a fraction to that of standard construction, in some cases going from a 20-month project to a 6-month project. This streamlined process allows the hotel to be opened quicker and start generating revenue as quickly as possible, allowing Marriott to get a quicker return on investment and grow their properties at an incredible rate. Next, Green Dwellings and Southeast Modular Manufacturing came together to create this modular home that is LEED Platinum certified. The structure consists of 3 individual modules that were installed onsite in just a day. It was crafted out of steel, concrete, and glass in a fully controlled manufacturing environment. In comparison to an on-site build, the controlled factory environment keeps material waste to a minimum and goes a long way to preventing the damaging of materials. However, the house itself reaches for the pinnacle of green living. Utilizing a combination of solar panels, energy smart electronics, and HVAC system, and LED lighting systems, the building itself projects to run on as little as $90 a month of energy. Green Dwellings even offers the option of going off the power grid all together with the installation of battery storage. 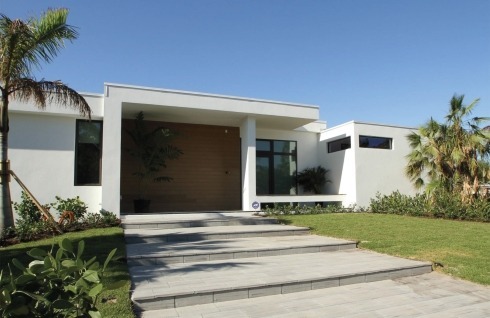 The building is designed after Green Dwellings “Palm Haus 3” model and offers 3 bedrooms, 2 baths, and roughly 2,500 square feet of living space. And the project earned honorable mention in MBI’s modular awards for 2017. 3. Key West Golf Club & Panel Built, Inc.
Another often overlooked aspect of modular construction is the structural integrity and durability it has to offer. 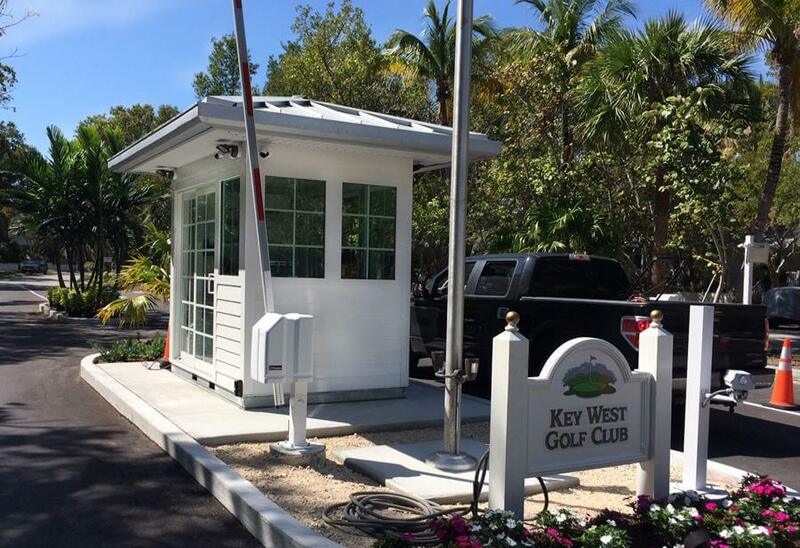 Towards the end of 2016, Key West Golf Club was looking to upgrade the guard house at the entryway of their complex. The guard house that they had at the time was beginning to show signs of its age. As a beautiful resort destination, the Key West Golf Club was not willing to accept anything less than the most pristine and beautiful entrance to their course. Russ Vickers, the President of the club’s Homeowners Association, searched through a number of options to find a solution to their problem. He needed a building solution that could be installed on site quickly to minimize any downtime or traffic disruption, but the structure also had to be able to comply with Florida’s stringent building code. In this case, any new construction would need to satisfy strict wind load ratings that go along with the harsh hurricanes in the area. Russ came to Panel Built, Inc. with these requirements, looking for a modular building that could fit these needs. Their new modular guard house building was up and running in January of 2017. One of the biggest and celebrated benefits of modular construction is, of course, it’s ability to meet strict project deadlines and complete projects in a fraction of a time of stick-built construction. Here’s one of Modspace’s modular construction projects. In this video, Modspace shows the modular construction process on-site step by step. To start, the property contained a residential building that needed to be demolished to make room for a temporary office space. Next, the site needed to be prepped, including clearing any leftover debris, filling in the site with concrete, transporting the modules site, and installing them together. With the modular construction process, Modspace was able to provide a full 7 unite modular office complex in 38 days. Finally, the Apex House provides a perfect example of why modular construction is often compared to toy building blocks. 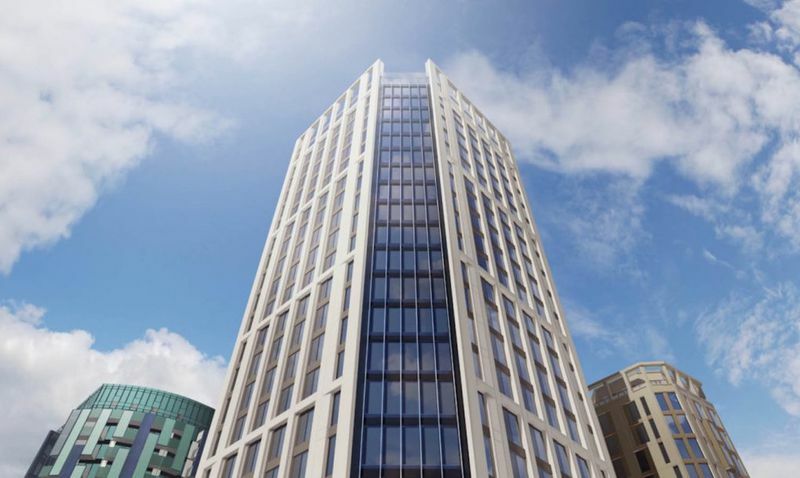 The Apex House from Tide Construction Limited and Vision Modular Systems UK is a student housing development and the tallest one of its kind, comprised of 679 separate modules. The modular tower is located in Wembley, London, has 29 different stories, and provides 580 beds for students in the area. The entire project took just 12 months to fully construct. During its construction, the award-winning tower was lauded for its ability to seem nothing like a regular construction site. With a vastly reduced amount of equipment and overall number of workers on the project, the tower did not have any of the typical looks or sounds of a stick-built building. One crane to put the modules in place, and workers to go in and anchor it in place. Also, the consistency the modular construction provided allowed for a more predictable overall cost. The factory-like environment offers a predictable construction schedule with far less waste produced. This mean scheduling on the job-site is easier to map out, plan, and predict which equals less overall downtime. Looking through these top modular construction projects of 2017, it is easy to see why the hype surrounding the modular construction industry has become what it is today. Simply saying a certain construction process has different benefits offers nothing but potentially empty promises. However, when a contractor can go through previous jobs and see a history of success, it becomes something that is impossible to ignore. Time-saving, quicker Return on Investment, green initiatives, incredible durability, and reduced project uncertainty are just some of the many benefits seen in the modular construction industry in 2017; who knows what the new year will hold.